Welcome to Old Town Bay St. Louis! Hot Spot Activities are 4:00 - 8:00 p.m. The Bay Cottages, owned by Ronnie and Sandy Robert, are the perfect place for you to stay if you would like to experience Old Town Bay St. Louis like a local! In the Laditude Adjustment accommodation you will find one bedroom with a queen bed, one bedroom with two twin beds, and two twin size sofas in the living room. In the “Southern Comfort,” sleeping arrangements include one bedroom with a queen bed, one bedroom with two twin beds, and one queen sleeper sofa in the living room. There is also a shared front porch and back deck for you to enjoy the outdoors. Bay Town “Inn features ten guest suites of over 500 square feet” which each include a kitchen and living area, "full bath and bedroom with a king bed.” Many of these king suites offer a beautiful view of the pool and courtyard as well. There is also the poolside accessible room which features two double beds, a large bathroom, and a kitchen area. The “second floor Lighthouse Room is over 700 square feet with a queen bed, sofa-sleeper, full bath and kitchen area.” This spacious room also features its own private deck. In true bed and breakfast fashion, the Inn serves full breakfast room delivery on Saturday and Sunday, and a lighter breakfast during the weekdays. Enjoy a homey atmosphere, and relax in a luxurious waffle weave robe which you will find in each room, as well as fresh flowers during your stay. This charming townhouse located on de Montluzin Avenue in Old Town, is the perfect family friendly getaway. 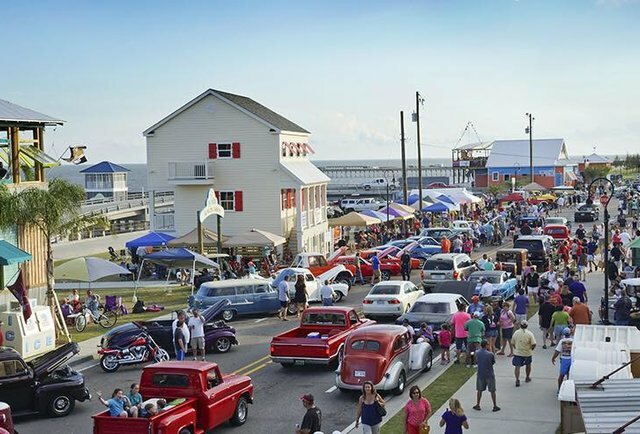 Nikki Moon, owner of the Bay Town Inn across the street, renovated and opened the townhouse for Cruisin’ the Coast in October, 2018. “I wanted something that was family friendly…people with children could come in and enjoy the beach, enjoy Old Town” she explains. Carroll House Bed & Breakfast is owned by Jane Alford-Kulpeska, and can be found on Carroll Avenue in Old Town Bay St. Louis. Find “warm southern hospitality” at this lovely Victorian style home built in 1890. “It was a life dream of mine to own and operate a bed & breakfast” Jane says. She bought the home in 2006, renovated it, and brought it back to its “original splendor.” She then lived there until 2011. After moving into the cottage next door, she was ready to open the B&B for business. The home is on the national historic registry, and features three bedrooms, each with a private en suite and a large claw foot tub. “Each room is furnished with lovely antiques, luxury linens, free Wi-Fi and DirecTV.” There is also a separate beach cottage on the grounds, which features one bedroom and a full kitchen. The home features large front and back porches as well, “great for gatherings or relaxing and reading a good book. I have walked up on the back porch many times to find a guest napping on the porch sofa” Jane recalls. There is also a wrap-around deck and furnished front porch to enjoy your evenings on. Sit back, relax, and watch the world go by in this quiet, residential neighborhood. The home also features a BBQ pit, and a shaded picnic table for a peak southern living experience. A charming picket fence surrounds the uniquely pink home, and one of the best features of this vacation rental is the two-car carport. The home had been closed for 15 years before they discovered it. It was run down and needed a lot of work. Nevertheless, they saw the potential, and asked if it was for sale. “We made an offer, and the following day we got it” Joan recalls. They originally saw the home as a great place for their sons to stay in with Joan’s mother while they were attending school nearby. The couple renovated one room at a time, and slowly, but surely, restored it to its original glory. Once the boys graduated, “the house stayed vacant for a while, and finally we said, ‘we could open a bed and breakfast here, and we did’” Joan explains. The Trust Bed & Breakfast opened its doors in 2000. During Hurricane Katrina, Hilton and Joan found refuge in the bed & breakfast, which was ruined during the storm. They once again had to renovate the home. “We were able to get back in full force in about two years after the storm” Joan explains. Located on Bookter Street, this historic home, built in 1850, is 10,000 square feet, and has seven bedrooms, each with a private bath. Children are welcome here, as it has been a family home for years. It is also located close to the shops, restaurants, and beaches. “I believe that what we have tried to do here is keep the house in character of the years that it’s been here,” Joan explains. In the home, you will find lovely antiques that the Eymards have taken special time to collect over a period of time — which fit the home very well. You will have a relaxing, wholesome, and historic experience at The Trust Bed & Breakfast. Hilton and Joan are also extremely accommodating, and go above and beyond to make sure that their guests are comfortable and have everything that they could need. “It’s more of coming in and acting like a family with strangers than going in a hotel room and being private” Hilton Jr. explains. This is something that sets The Trust apart. The Trust Bed & Breakfast is a place where you will truly immerse yourself in your peers and share experiences amongst one another. Call 228-467-5715 for more information. Gulfview Properties currently manages and owns five vacation homes, which includes The Bungalow Bed & Breakfast and The Abode Guest House. “Our specialty is older classic homes in the historic district” Kevin explains. “Manieri Real Estate manages a number of Vacation Rentals in Bay St. Louis. These properties are listed on VRBO.com" manager, Joey Manieri explains. These VRBO listings include, VRBO #1506453, VRBO #36901, VRBO #49042, VRBO #960130, VRBO #1543165, VRBO #735458, VRBO #497992, VRBO #1455843, VRBO #313124, VRBO #400259, VRBO #987619, VRBO #1034190, VRBO #909248, and VRBO #639097, with three or four more vacation rentals to be expected to join soon. Click on the cover to open the tour now! The Bay's Walking/Biking Historic Tour is proof in print that history doesn't have to be boring! And now it's available in a nifty PDF version, so it can go with you on your phone! Click to open it up and get going right now! Look for an updated print version available free at various merchant locations throughout Old Town in the coming weeks! In the June 2017 issue of Vogue Magazine, Bay St. Louis is featured in the article "A Summer Road Trip Along the Mississippi Gulf Coast". Share it with friends and business associates. To read the article in Vogue Magazine, click here! In March of 2017, Bay St. Louis was featured as one of Thrillist 13 Amazing American Beach Towns you can actually afford to live in. Explore Old Town and find out why! In March of 2017, Glamour Magazine named Bay St. Louis as one of eight cool, unexpected American destinations for women to consider for a solo travel destination. So start bragging! ​Share it with friends and business associates. To read the article in Glamour Magazine, click here! 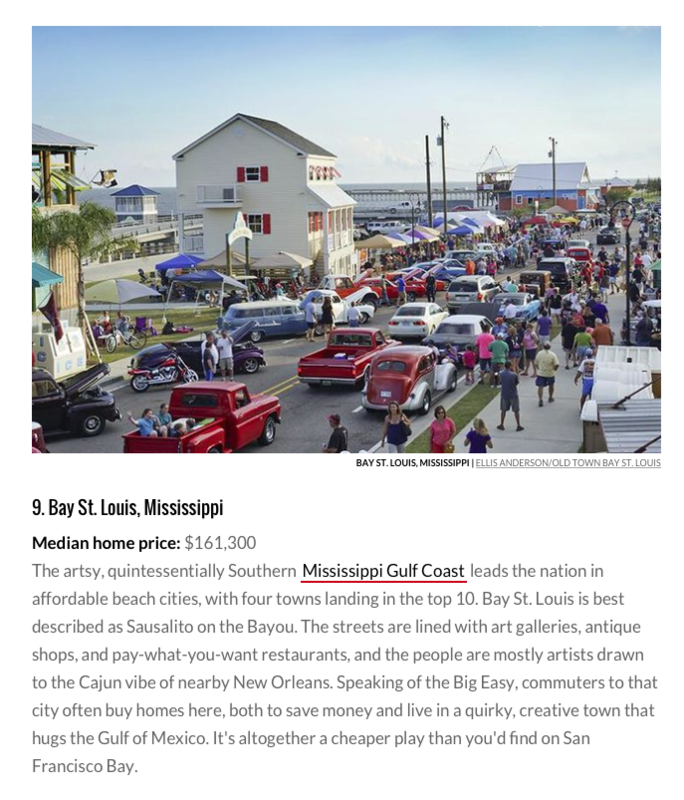 BAY ST. LOUIS WAS ONE OF ONLY TWELVE MISSISSIPPI LOCATIONS TO BE SELECTED FOR THE "OFFICIAL BEST OF MISSISSIPPI" FEATURE. NOMINEES UNDERWENT A RIGOROUS SELECTION PROCESS. SEE WHY WE WERE CHOSEN "BEST PLEASURE SEEKER'S PARADISE!"